After landing at the Victoria Falls Airport, we hopped in a cab and headed to Lorrie's B&B. We dropped our stuff off and took a walk into town to see the falls. We had heard that this was the low season, which meant the falls wouldn't be at their peak but we were NOT disappointed. 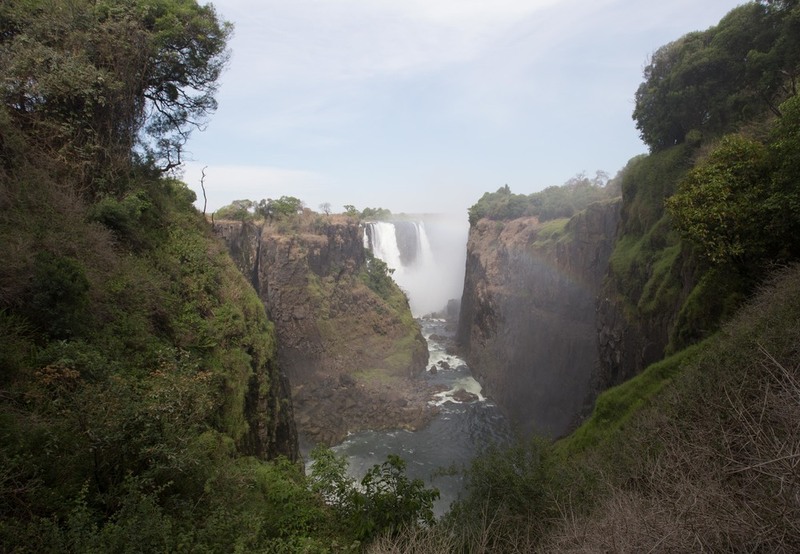 The waterfalls are actually on the Zambia side but supposedly the best views are from the Zimbabwe side, where we were. There's a loop you can walk with tones of different view points and it was pretty magical (which it better be for the $30 per person entrance fee!!). This place also had some dogs that, again, took an instant liking to Dennis. One of them kept dropping her toy in the pool so Dennis would get it and throw it for her, but then she accidentally bit Dennis (she was just trying to get her toy), so that ended playtime. We were staying at Lorrie's for a night after our camping trip in Botswana as well so she let us leave a bunch of our stuff that we didn't need there AND she gave us sheets and pillows for camping. It was perfect. After our night in Vic Falls, we got picked up by the safari company and headed towards the border of Zimbabwe and Botswana for a week in the bush!